Professor Nichi D’Amico, President of INAF and Head of the Italian Delegation, initialling the SKA Observatory Convention at the Italian Ministry of Foreign Affairs and International Cooperation. Rome, Friday 25th of May 2018 – Negotiations to agree the international treaty establishing the Square Kilometre Array (SKA) Observatory have formally concluded, opening the door for founding members of the new intergovernmental organisation to sign the treaty later this year. 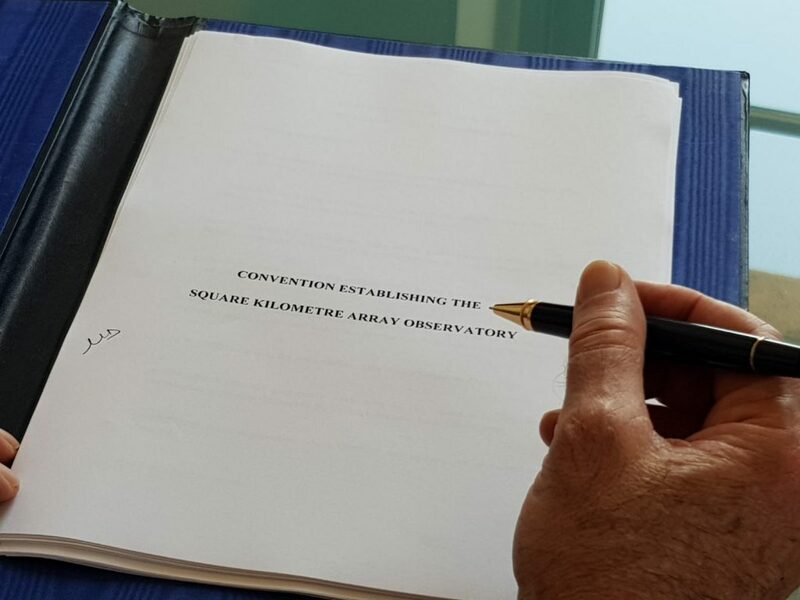 Following four rounds of negotiations over the past two and a half years, the text of the international treaty establishing the SKA Observatory, known as the Convention, has been agreed by all parties. Italy, which led the multilateral negotiation process, was the first country to initial the document at the Italian Ministry of Foreign Affairs and International Cooperation. Professor Nichi D’Amico, President of the National Institute for Astrophysics (INAF) and Head of the Italian Delegation, visited the Ministry on Thursday 24th May with pen in hand. Each party has now been invited to initial the document, a critical step towards the establishment of the SKA as an intergovernmental organisation. Later this year, Ministers of the founding members of the Observatory are expected to sign the treaty in an official ceremony to be held in Rome. Depending on each country’s legislative process, the text will then have to be ratified by parliaments for the SKA Observatory to formally come into existence.